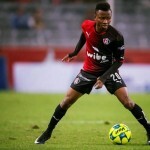 Ghanasoccernet.com sources in Italy misled it in earlier reporting claiming Allies received $800,000 from the sale of the player but the club has presented documents that shows $200,000 was received from the transfer. The 18-year-old has also agreed terms with the Udine-based side and will ink a long-term contract which is expected to be five years. Udinese had Aboagye on trials last season but could not offer him a contract because of his tender age. However his eye-catching displays at the 2013 FIFA World Cup in Turkey attracted a flock of big-name European sides around him. Arsenal and Valencia were among the suitors but he would be heading to Italy. The diminutive midfield nimble-footed maestro will however be sent on loan at Spanish side FC Granada on a season-long move where he is expected to garner first team experience - a move pundits think could be good for the youngster. Aboagye become the seventh Ghanaian player to sign for Les Zebrettes in recent memories after Stephen Appiah, Mohammed Gargo, Sulley Muntari, Asamoah Gyan, Kwadwo Asamoah, Emmanuel Agyemang-Badu and Azian Innocent Tano. He was voted theÂ adidas Bronze BallÂ winner at the FIFA U20 World Cup finishing behind France's Paul Pogba and Nicolas Lopez. of Uruguay. This will mature into one of the finest footballers the country produces. God be wt him. d bst bargain 4rm gh 2 abroad so far. bst of bro. Can one bear me a witness on that which i just said? 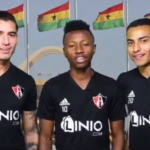 Ghanaian players are too hot and wanted by the europeans any time any minute. Look at the U20 now. They are all chased by clubs. But pls, let some one close to these boys tell them the truth, to go for the small clubs where, they will get more playing time. Up mother Ghana. Long live mama Ghana. U are too respected any where in the world. Mama pls, tell ur children not to fight after the verdit. Although, the devil from nigeria, Obasanjo came to Ghana with polution in the election, he thought Ghana is corrupt like his conterminated nigeria. No! The hands of God is upon Ghana and can never be like the Bokoharams. Ghana is the Isreal of Africa and can never be dead like nigeria, amen!!! this is certainly not a good bargain.$200,000 is a peanut. Your mother is an Igbo whore and your father a Yoruba IDIOT!! Your future spouse will be a Hausa-Fulani monkey from North Nigeria you filthy rat!!!! $200k for five yrs aint worth it, becuz he will excel in 2yrs and nee abetter contract or insert in the contract about how the contract will change based on his improvement. He's not the 7th player of Ghanaian decency to be signed by Udinese as reported. Aziz Tetteh, Rabiu Mohammed, Richard BOateng and Fatau Mohammed were all signed by Udinese. Get your facts right please.